If you are not a particular fan of squirrels then perhaps you had better leave the page right now. 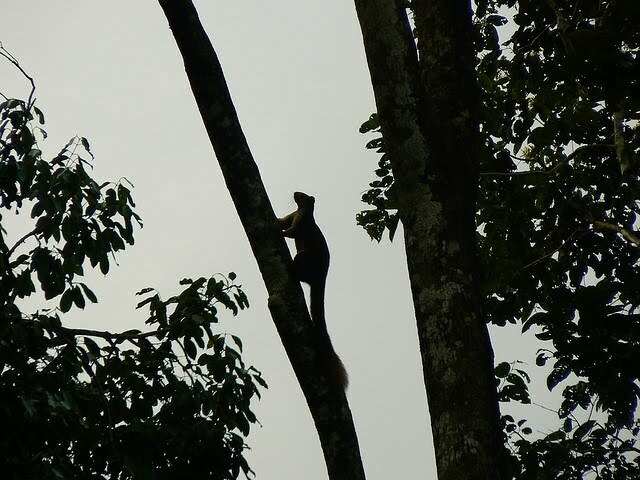 Whoever gave the Indian Giant Squirrel its name was not joking. It makes the European and North American squirrel look like dormice in comparison. 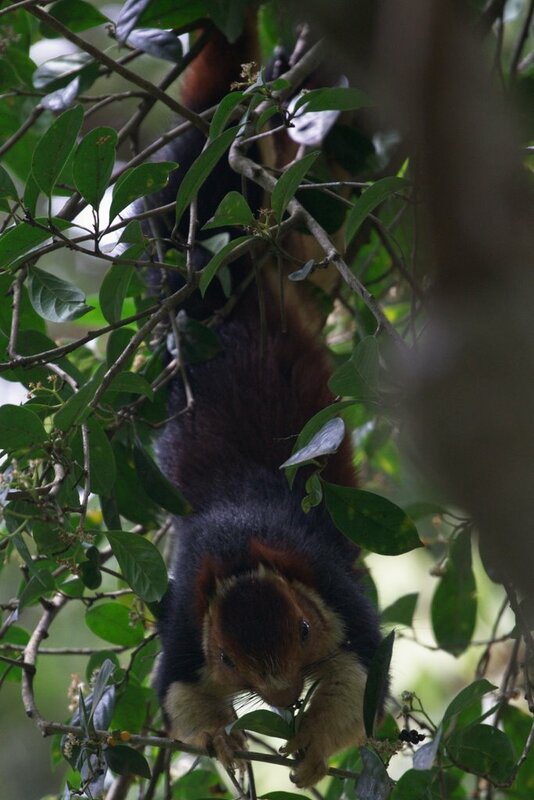 This is no ordinary squirrel – secretive and shy, it is indeed a giant among its kind. Before you start to lock your windows and gaze worriedly at the canopy as you pass beneath, be assured that you may only come across one of these if you live in Peninsular India or you happen to be visiting a zoo. 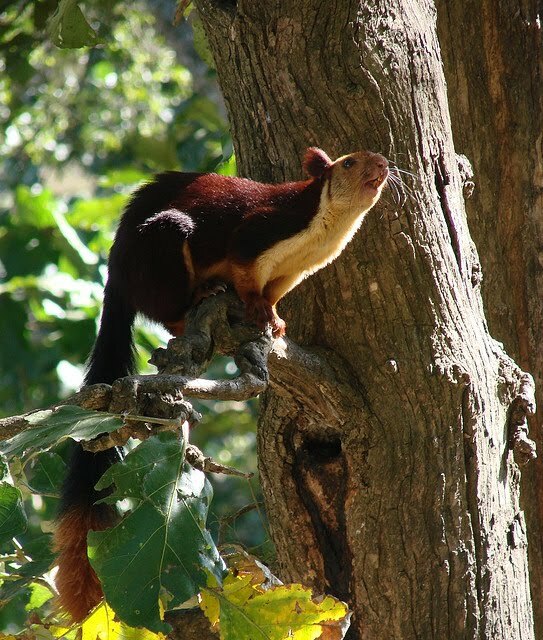 They live in the evergreen and mixed deciduous forests there as far north as Madhya Pradesh in isolated ranges. 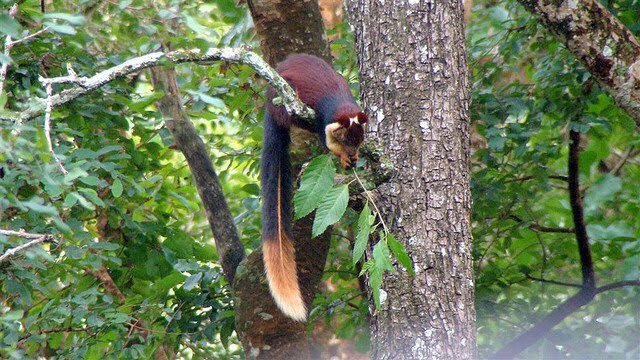 Known also as the Malabar Giant Squirrel, Ratufa indica is easily distinguishable from its smaller relatives, having a very conspicuous color scheme which can be either two or three-toned. The head and body of this gorgeous looking animal is up to sixteen inches in length, compared to the ten of the Eastern Gray found in the US. What really gives the Indian Giant its appearance of size is its tail. The tail can be anything up to two feet in length. Plus it is heavy – a healthy adult weighs in at around four and a half pounds. 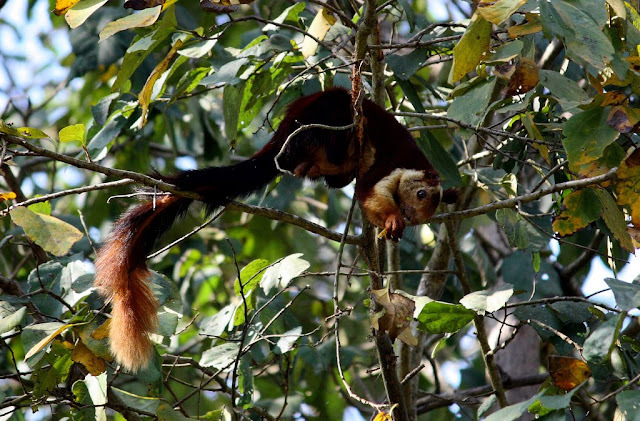 With their tan, rust, brown or beige coloring they are possibly the most colorful of the 280 squirrel species. Altogether it looks like it has been metaphorically down the gym and on steroids – in terms of squirrels at least. 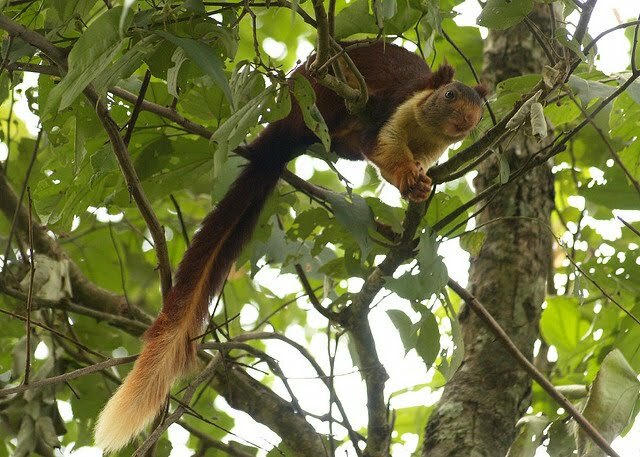 The Indian Giant Squirrel shares characteristics with many of its cousins. It is diurnal which means it is active during the day and sleeps at night. 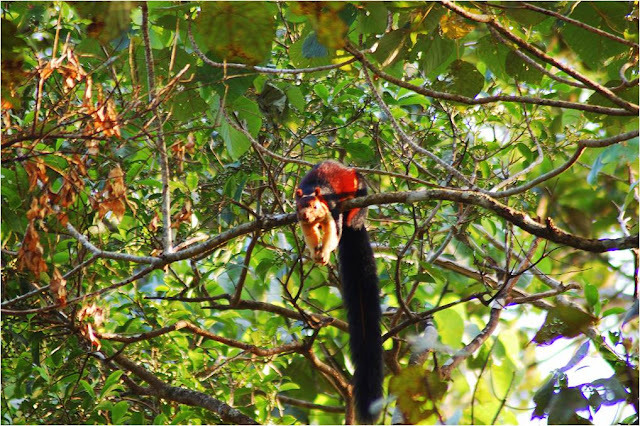 It is arboreal, which means it lives in trees – and the Indian Giant dwells in the upper canopy and rarely leaves the trees. Tall trees with as many branches as possible are the ideal choice for its nest. 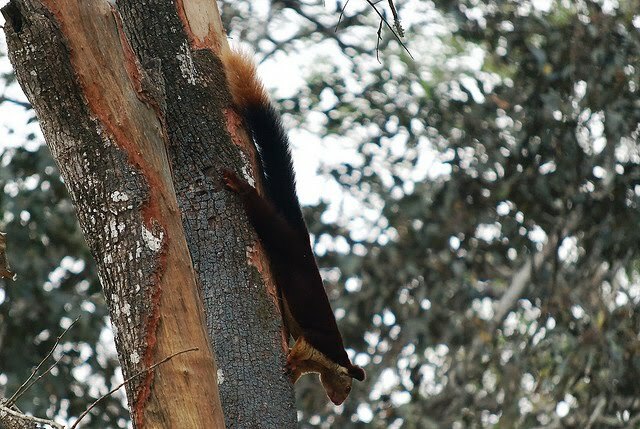 The squirrel lives on its own or in a mating pair. Their nests are large (out of necessity) and globe shaped and they build them on thin branches as high up as it is possible to support the weight. This is to avoid its predators. 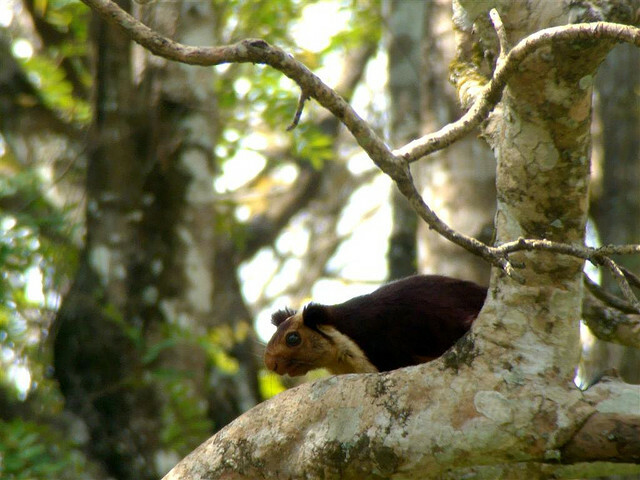 The nests are only noticeable in the dry seasons but it has been noted that a single squirrel can build several. It uses one for a nursery and the other it uses for rest and sleep. It seems the Indian Giant does not like to share a room with the kids. It is also herbivorous, which may be a relief to a few of you reading this. That means that it has adapted to eat plants. However hungry an Indian Giant gets, he or she will not propel themselves from the canopy to make a meal of your nose or ears! Predators hunt the IGS (as perhaps we should call it) and it often falls victim to birds of prey and leopards. When it senses danger it often presses itself up against a branch and freezes. 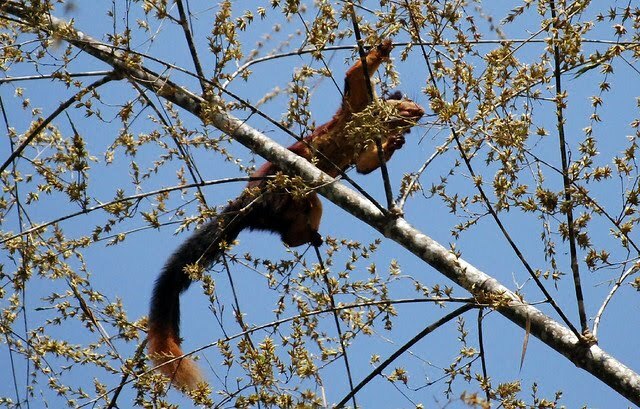 Considering it can jump up to six meters (20 feet) from tree to tree this could be interpreted as strange behaviour. Yet it is a shy animal and not easy to detect so perhaps when it freezes it is simply trying to blend in with its surroundings and by ceasing movement to avoid predation. 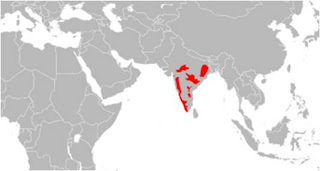 It is on the UN List of near threatened species, so it can only be hoped that the remaining Indian Giants avoid their predators and flourish in the forests of India.